5PBenita is one of our top Champion producing females on the farm! With extremely fine and very tiny crimped fleece , this girls gives strength of genetics and solid bone structure to each of her offspring. She may be older but is aging like fine wine and producing fabulous crias no matter which Champion herd sire we breed her to. Now that's the sign of a grand dam! Sunset Hills Polaris, is the handsome son of Jedi Accoyo of the USA and our Color Champion Producer 5Peruvian Benita! If you recall, Benita, an Peruvian import from the Alianza area of Peru, has produced consecutive Color Champion offspring for us,(SHF Sundance, Sunset Hills Summer, Sunset Hills Zodiac) and, Sunset Hills Polaris may be her best yet! Jedi Accoyo of the USA, is a wonderful match for Benita, he himself, is a Color Champion and has produced Color Champions. Jedi is the son of the famous Color Champion and Champion producing, Caligula, who is no longer with us. Polaris is a stunning male, with a regal stature, strong bone structure and very straight legs. Sunset Hills Polaris is another fabulous fleece producer. 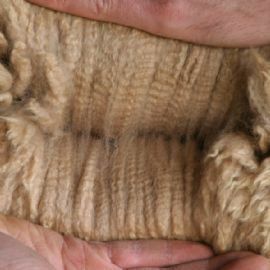 He has a very tiny, definitive Merino style crimp, which is consistent from neck to shoulder through to his hind quarter, with berber-like density. The fleece handle is extremely soft with lots of brightness, silky look to it as demonstrated in the photo. 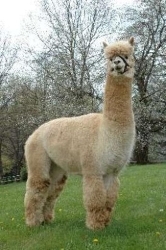 He has also produced some lovely cria for us including most recently Sunset Hills Polar Ice who is a multiple champion. Come visit the farm to see this wonderful male and others. 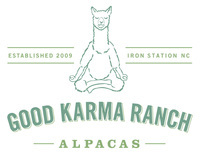 We and our alpacas would love to have you visit. 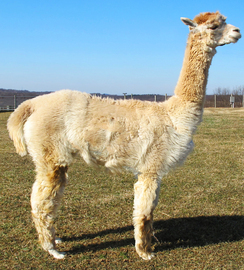 We proudly co-own this stunning male with Flying Pony Alpacas! 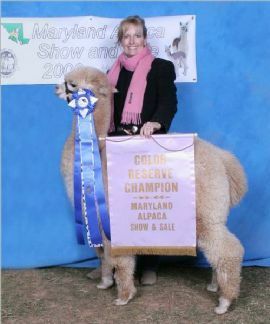 Blue Ribbon and Reserve Color Champion MAS 2006! Blue Ribbon "Best Bred and Owned" OABA 2006. Color Champion/ Blue Ribbon winner Buckeye 2006! Blue Ribbon OABA Alpacafest 2006, T. Lavan.